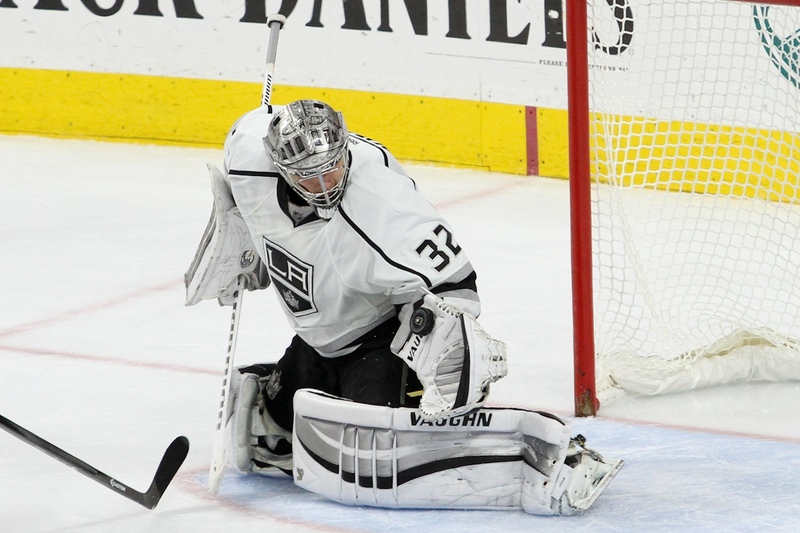 No miracles were forthcoming for LA on Wednesday night as they took a dispiriting loss to an energetic San Jose team to open the season. 5-1 was the final, and the numbers did no favors to LA. Twenty shots, though they gave up 32. On the power play, 0/6. More faceoff wins (38-36) and hits (33-19) but also more giveaways (7-2) and fewer blocked shots (10-13) than the Sharks. Nick Shore got the goal for the Kings. His regular season stats last year showed 34 games play with one marker. He’s now equaled that in what fans hope will be a more productive season than last year (six assists to go along with the goal). He did get a penalty for closing his hand on the puck later in the period. Maybe he was trying to grab it as a souvenir (just checking to see if you’re reading). The first period was barely two minutes old when the “there’s no fighting in the NHL” mantra was put to the lie. Kyle Clifford took on Mike Brown, each earning a major for the tilt. This was two seconds after the Kings had opened the scoring on the Shore goal. The LA team would not find the net again, though Lucic had a good pass go just by him as he drove to the net on the right side at one point. What that means, as any Einstein can see, is that following that quick start, the LA team let in five unanswered goals. It is perhaps telling that of those five, each was scored by a different San Jose player. In other words, this wasn’t a case of one guy being on a hot streak to start the year. Perhaps all that was interesting from an LA point of view on the night was the rough stuff. In the third, Matt Greene made a late, hard (clean) hit against Barclay Goodrow, and Goodrow ended up fighting Andy Andreoff, who came into the altercation late. That cost two five-minute sitdowns as well. As P3 was winding down, Couture of the Sharks made a hit on the Kings new wunderkind, Lucic, just as the former was stepping out of the box. The former Bostonian then skated behind Couture to the bench and hit him high to the head with outreaching arms as he got to the boards. That received a match penalty. Notable too is that the Kings have a lineup largely the same as last year. Ehrhoff was the notable newbie on the night. But detailing that is for another story, so watch this space as the early days of the season unfold. LA now has Arizona on Friday night in a 7:30pm start. Follow me on twitter @growinguphockey. Note that media information was used in compiling this story.